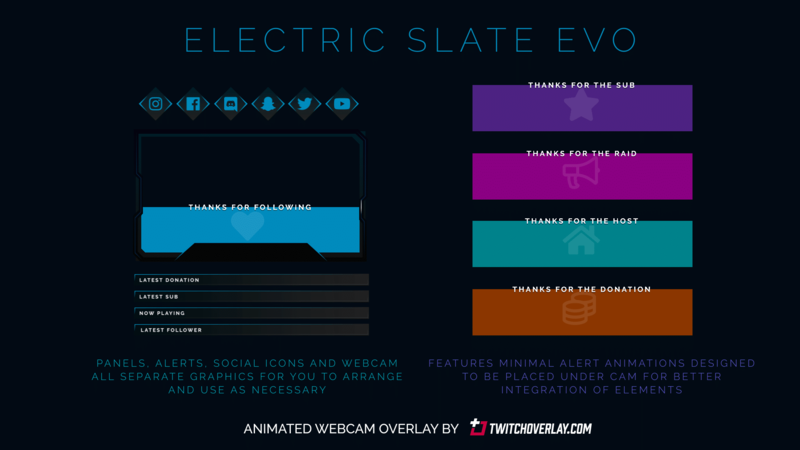 Electric Slate Evo is an animated blue overlay that reworks, and greatly elaborates on, our existing static webcam overlay, Electric Slate. Using the structure and shape of that design as a base, we’ve refreshed the look with a more muted and stylish blend of blues, laying below a pulsing circuit and nameplate that offers a subtle but noticeable animation, giving the webcam some life. 2x webcam frames – both in the same style, but one made for 16×9 cam ratios, and one for 4×3 ratios, depending on whether you’re using an HD or SD webcam to broadcast. 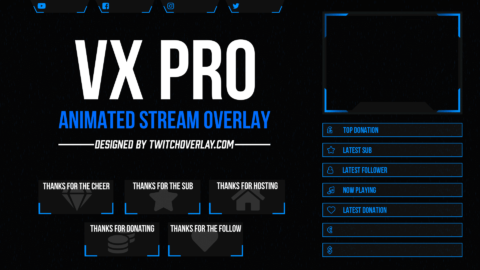 5x panels – headings included are Latest Donation, Latest Sub, Now Playing, and Latest Follower. Also includes a blank panel for you to use for general purposes. 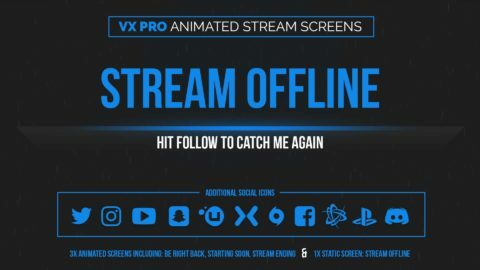 6x social icons – these are designed to either float outside, or on top of the webcam frame, and for you to write your own social usernames in OBS/xSplit and place them just over the top. 5x alerts – minimal alerts in different, complimentary colours, featuring headings for Subs, Raids, Followers, Donations, and Hosts. These alerts are designed to be placed underneath the cam, at the bottom, so that notifications are integrated with the webcam frame. They can also be used as standalone alerts if you’d prefer. 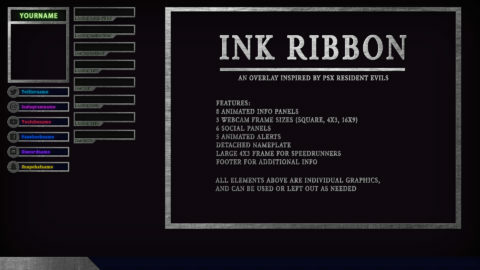 Minimal design so you can add opacity and make them slightly transparent if you feel they obscure too much of your cam.